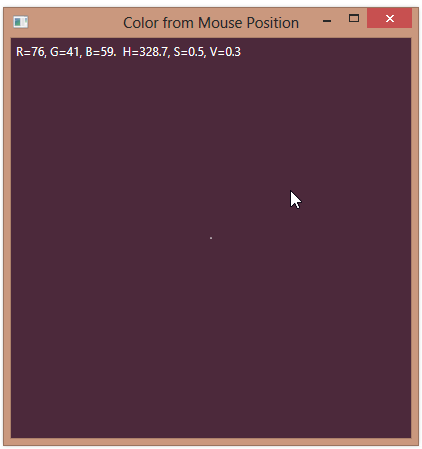 In the previous post, we used the mouse position to map to the Hue and Saturation portions of an HSV color value and then set the background color of a window based on the mouse position. This post adds to the example, by using the mouse wheel to control the Value portion of the color (which ranges from 0.0 to 1.0). (See the earlier post for the ColorUtil code). We can now roll the mouse wheel down to reduce the value, making the colors darker.